The aim of the organisation is to offer people who wish to enter the field of Dog Training and/or Behaviour Counselling a starting point. It also benefits present day trainers who may feel they are looking for some refreshing content to add to their classes. It allows people from both the United Kingdom and every corner of the world an opportunity to join one of the most successful canine related organisations. Whether as a career change or hobby we offer a well laid out set of 6 training courses which participants study online. So many people begin dog training without the required knowledge or even a business plan. The information provided within the structure of the ADTB courses is designed to help would be Trainers to plan ahead. It also allows present day trainers to keep abreast of new and modern training methods. Within the ADTB we believe that practical training experience is a “MUST” before people undertake hands on training of dogs but everyone must start somewhere and we truly believe our courses are a great place to start. The ADTB does not provide practical training courses. Find out about the Academy Of Dog Training And Behaviour. 6 training courses that participants study online. Courses are completed in the comfort of your own! If you need to know more, click below to get answers. Click the button below to renew your membership. To provide a framework of canine care and knowledge for those wishing to become dog trainers and/or for those wishing to expand on the training skills. To assure the dog owners they are training that their standard of care, sympathy, method, kindness and wellbeing of dogs is of the highest standard. I have been training dogs for more years than I care to think about. These days experience counts but clients want to know that you have the theory and understanding behind that experience. This is where the courses run by the ADTB come in, apart from giving you structured information they also draw on that experience and test that you have taken on board the knowledge at a suitable level. You can follow these courses at your own speed, the time scale is in your hands. I can highly recommend these courses. DearJenni, I have just finished reading "What makes Dogs Tick" for the 5th time. I've made my whole family read it too. It's really well put together and really makes you realize just what you have to consider as a dog owner for the benefits of your dogs health, and the different responsibilities as a dog trainer. I am really happy with the insight it has provided so far and just wanted to say thank you. I would like to give my opinion on the ADTB courses. Since starting them in September I have completed the first two courses and have been very impressed. Initially I was slightly worried that they might be too academic for the likes of my good self to get my head around but actually I have found them to be extremely thorough and detailed with loads of practical tips and interesting course material. Lots of support is on offer if it is needed. I am looking forward to continuing to the next level in the near future and I would heartily encourage anyone who is considering taking the plunge to DO IT! 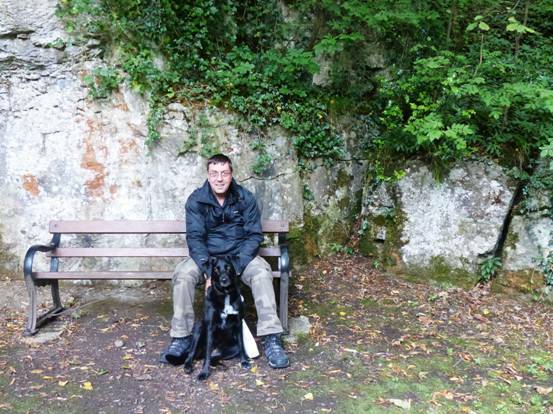 I'm Malcolm Hewitt I started my ADTB courses in early May 2005, I have just finished the Gold course and I am being assessed on Friday 4th November, 2006 at my own club PAWSITIVE DOG TRAINING which I started in June with my Daughters help. Regarding the courses they are very well laid out and the information is brilliant. I have learnt so much and I thought I knew a lot about dogs before. Also with Jenni in charge you feel it´s like a one to one basis she is so helpful.